The 51st entry in Charles Messier’s famous catalog is perhaps the original spiral nebula – a large galaxy with a well defined spiral structure also cataloged as NGC 5194. 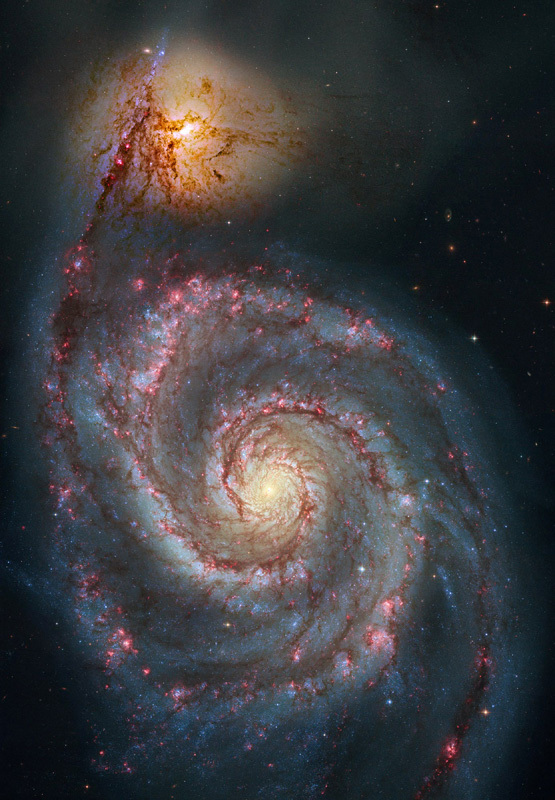 Over 60,000 light-years across, M51’s spiral arms and dust lanes clearly sweep in front of its companion galaxy (right), NGC 5195. Image data from the Hubble’s Advanced Camera for Surveys has been reprocessed to produce this alternative portrait of the well-known interacting galaxy pair. The processing has further sharpened details and enhanced color and contrast in otherwise faint areas, bringing out dust lanes and extended streams that cross the small companion, along with features in the surroundings and core of M51 itself. 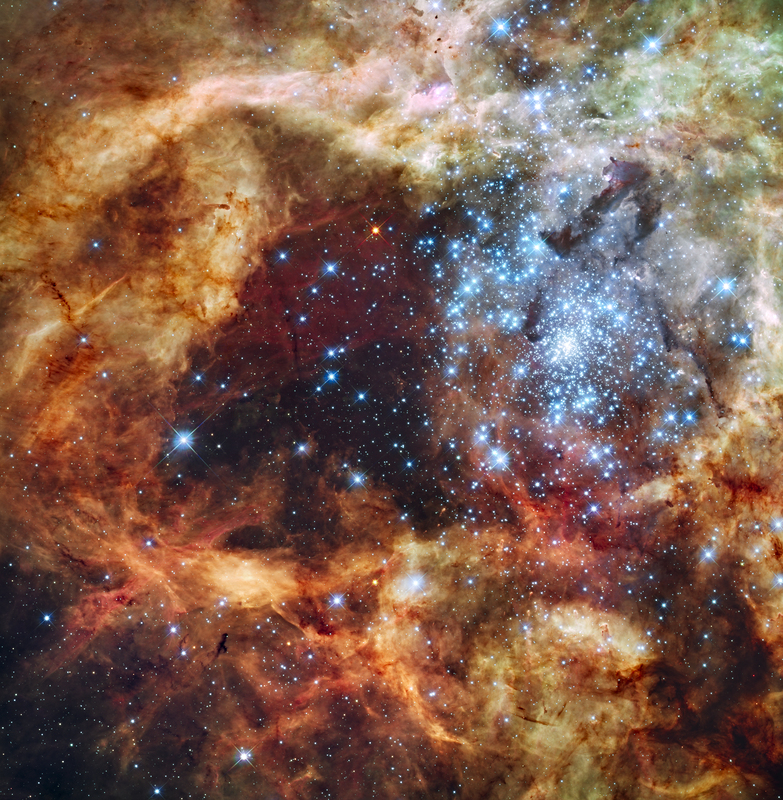 The pair are about 31 million light-years distant. Not far on the sky from the handle of the Big Dipper, they officially lie within the boundaries of the small constellation Canes Venatici. How do planets form? 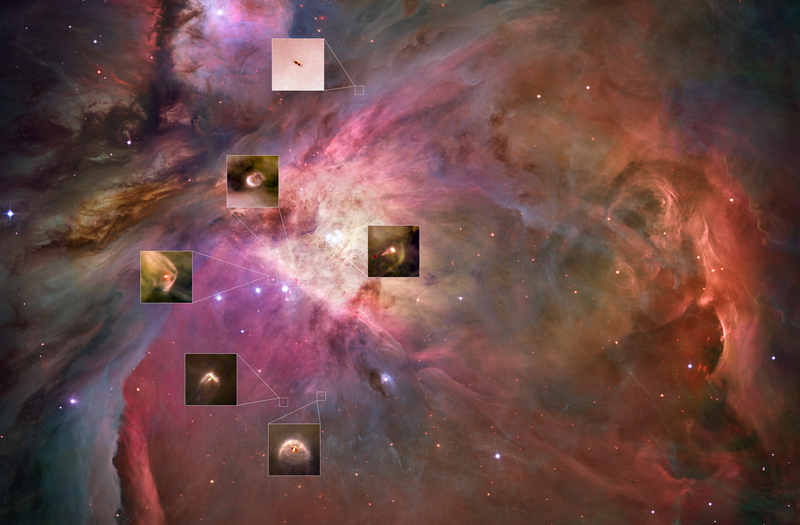 To help find out, the Hubble Space Telescope was tasked to take a detailed look at one of the more interesting of all astronomical nebulae, the Great Nebula in Orion. The Orion nebula, visible with the unaided eye near the belt in the constellation of Orion, is an immense nearby starbirth region and probably the most famous of all astronomical nebulas. Insets to the above mosaic show numerous proplyds, many of which are stellar nurseries likely harboring planetary systems in formation. Some proplyds glow as close disks surrounding bright stars light up, while other proplyds contain disks further from their host star, contain cooler dust, and hence appear as dark silhouettes against brighter gas. Studying this dust, in particular, is giving insight for how planets are forming. Many proplyd images also show arcs that are shock waves – fronts where fast moving material encounters slow moving gas. The Orion Nebula lies about 1,500 light years distant and is located in the same spiral arm of our Galaxy as our Sun. The graceful arc of the Milky Way begins and ends at two mountain peaks in this solemn night sky panorama. Created from a 24 frame mosaic, exposures tracking Earth and sky were made separately, with northern California’s Mount Lassen at the left and Mount Shasta at the far right, just below the star and dust clouds of the galactic center. Lassen and Shasta are volcanoes in the Cascade Mountain Range of North America, an arc of the volcanic Pacific Ring of Fire. In the dim, snow-capped peaks, planet Earth seems to echo the subtle glow of the Milky Way’s own faint, unresolved starlight. 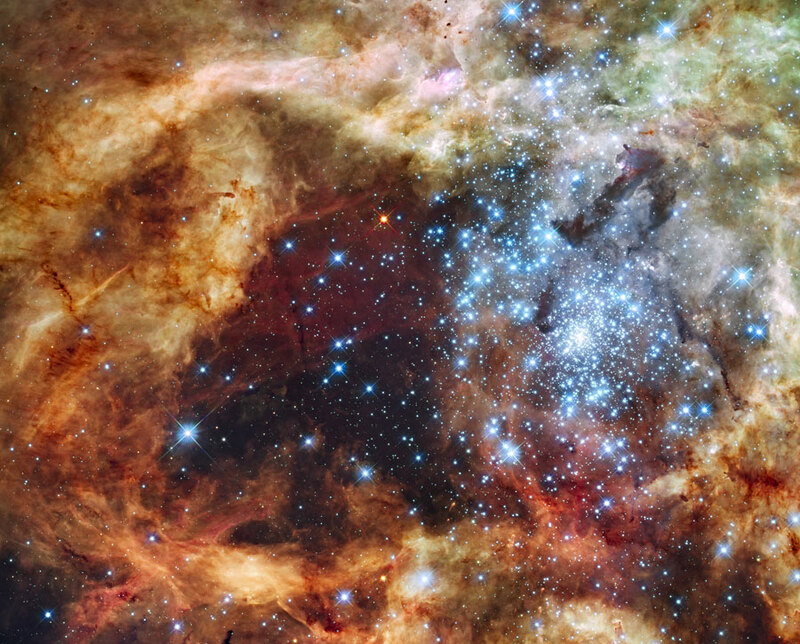 Wisps like this are all that remain visible of a Milky Way star. 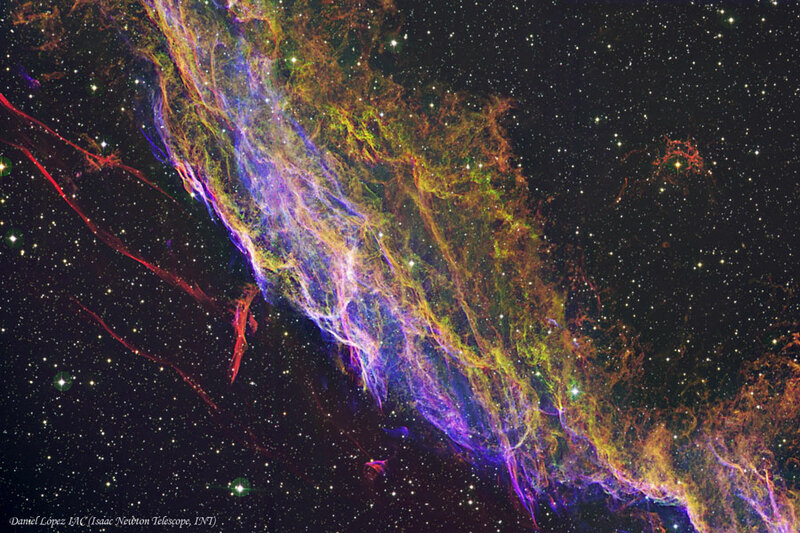 About 7,500 years ago that star exploded in a supernova leaving the Veil Nebula, also known as the Cygnus Loop. At the time, the expanding cloud was likely as bright as a crescent Moon, remaining visible for weeks to people living at the dawn of recorded history. Today, the resulting supernova remnant has faded and is now visible only through a small telescope directed toward the constellation of the Swan (Cygnus). The remaining Veil Nebula is physically huge, however, and even though it lies about 1,400 light-years distant, it covers over five times the size of the full Moon. 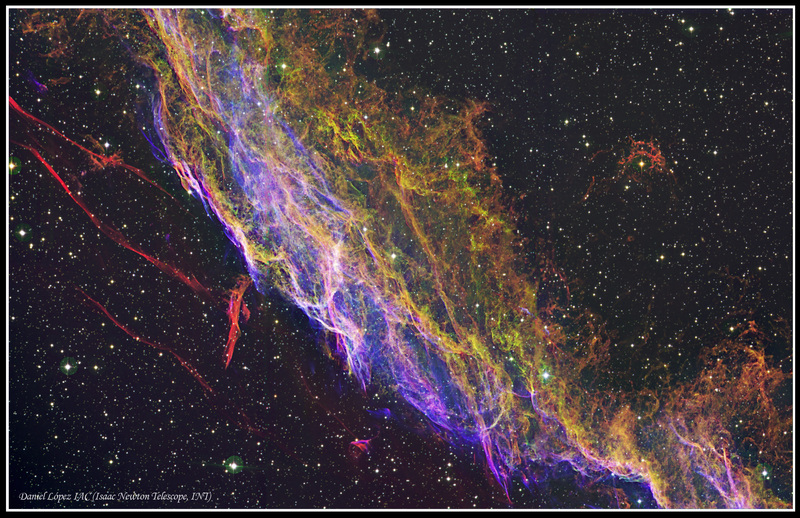 In images of the complete Veil Nebula, studious readers should be able to identify the above filaments on the lower left. The above image is a mosaic from the 2.5-meter Isaac Newton Telescope at Roque de los Muchachos Observatory in the Canary Islands.